1) this story has lost none of its power over me, despite the fact I know everything that's going to happen (quite an impressive feat for a largely plot-driven suspense piece). 2) it is without question, one of King's most underrated, overlooked novels. As of this writing its Goodreads rating is 3.35. Keeping it company in the basement is the much maligned Tommyknockers (incidentally another favorite of mine) and From a Buick 8 (3.32 but as this is my least favorite King novel I tend to agree with that number). 3) finally, if you aren't already a raving fan of this book I'm not going to change your mind. That's fair. We can't all love the same thing, especially when it comes to books. What I hope I can do is capture just a smidge the reasons why -- if you haven't yet -- you must give this book a chance. 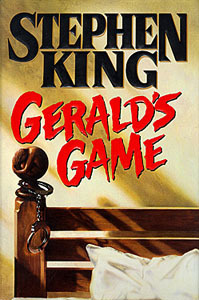 For a lot of King's Constant Readers, Gerald's Game will always be linked to its sister novel -- Dolores Claiborne -- as both books were released the same year and King meant them to be companion novels to one another. Their narratives are cleverly linked by a solar eclipse. As a literary device it is an interesting one, but for me it isn't what makes these novels so special or spectacular. In fact, you could remove that connection and neither novel would suffer from its absence. No, what makes each novel memorable is the writing, the characterization and most of all, King's sheer balls to the wall commitment to the delivery of the story and its outcome. As companion novels, there are some notable similarities; namely, the exploration of female abuse at the hands of male aggressors. There are painful descriptions of domestic battery and sexual molestation. King bravely (and quite successfully I would argue) enters the terrain of victim humiliation, degradation, and the lingering psychological effects such acts guarantee. In many ways, these are King's most feminist novels and I don't think it a coincidence that Gerald's Game is dedicated to his wife Tabitha and her five sisters. Yet for me, this isn't what defines Gerald's Game which I would argue has much more in common with Misery, King's Bachman novel The Long Walk, and his short story "Survivor Type". I say this because in all of these what King is really doing is looking at the human body under brutalizing physical duress... at the body in extremis and what humans are genetically hardwired to do to survive and go on living another day. Excruciating physical peril undeniably comes with a psychological component and no one writes that better than King using his own heady and addictive brew of storytelling. Jessie Burlingame -- our "damsel" in distress -- is facing certain death. She is trapped, chained in handcuffs to the bed she shares with her husband Gerald in their summer house on the lake. But it's not summer. It's fall, and the lake is empty. Everyone has gone home. There is no one to hear her scream or beg for release. In telling Jessie's story King uncovers all the nitty-gritty minutia of human physical suffering and the desperation of one woman's attempt to end it. How far is any one person willing to go to keep on taking his or her next breath? Stephen King knows pretty damn far. Just ask Paul Sheldon or Ray Garraty. Or the castaway in "Survivor Type" -- him most of all. King also knows that the human body has an amazing capacity for trauma. It can withstand a lot -- so much so that the mind often breaks first. King being King, it's not just enough to have Jessie at the mercy of handcuffs she can't merely wiggle out of. No, King being King, he introduces several other elements to the story to amp up the suspense and terror. Some may argue the story didn't need these elements (one element in particular), but I say Bravo! Those who have read the novel know what I'm talking about -- woof! woof! and "some people call me a Space Cowboy" is all I'm going to say about that. [Our first introduction to the "Space Cowboy" -- There was a man in the room -- nearly caused me to faint from pure shock. I was in those handcuffs too, you see, in the dark, thirsty, exhausted and in pain. The sudden realization that I may not be alone after all, that there may be someone lurking in a dark shadow of the room watching me.... shiver. [Gerald's Game] goes straight to the oldest, reptilian part of the human brain: fight or flight -- but here, flight's out of the question. This is true horror -- helplessness. This novel is burned into my brain as if I've lived it. That's unforgettable storytelling and something you don't want to miss. Trust me. You do trust me, don't you? This review is also posted to Goodreads. A Duane Swierczynski Triple Bill!